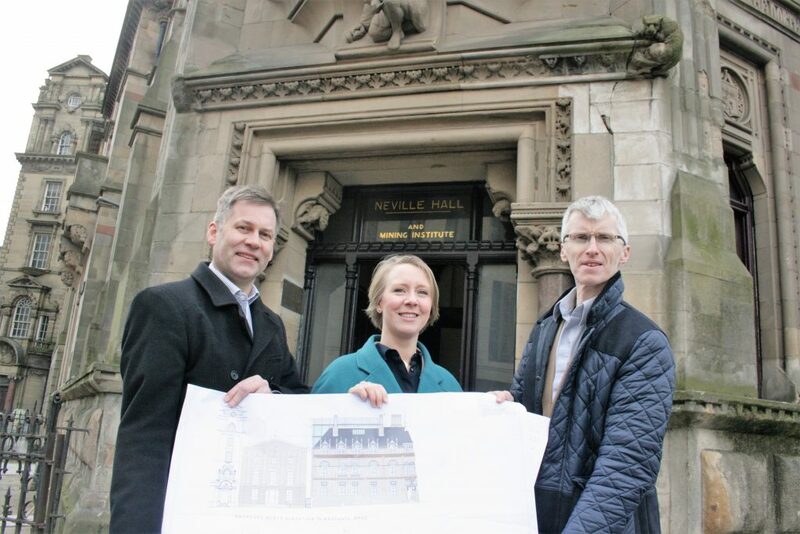 A planning application has been submitted to Newcastle City Council, which once approved, will breathe new life into one of the city’s foremost landmark buildings – Neville Hall, home to the North of England Institute of Mining and Mechanical Engineers (NEIMME). The building occupies a prominent position at the junction of Neville Street and Westgate Road within the central Newcastle City conservation area. With initial Heritage Lottery Fund (HLF) support* secured in November 2016 of some £600k development funding, the stage was set to transform this Grade II* Listed, iconic building which represents such a huge part of the industrial and engineering heritage of North East England. The Common Room, a new charity, is managing the redevelopment and refurbishment project. The charity was established in 2017 to secure a sustainable future for the Institute and build on its remarkable 165 years of history to give it a new role for the 21st Century. Its board of directors was able to use the £600k HLF development funding to get the transformation underway with the production of a fully-costed design, construction methodology, business plan and other activities with Gardiner and Theobald being appointed as project managers. It also facilitated the appointment of award-winning architect, Howarth Litchfield, following a competitive interview, to prepare a full planning and listed building application for the internal refurbishment and extension of Neville Hall and the Wood Memorial Hall. The proposals aim to sensitively convert the existing building and retain its extensive and unique historic library collection, refurbishing the ground floor reading rooms and enhancing the conferencing facilities to expand the community offering in the form of lettable conference, meeting and event hire spaces. It will also be necessary to integrate modern electrical and mechanical services throughout to cater for existing and proposed uses. “This is a hugely ambitious and exciting project which will play a key role in ensuring the sustainability of this area of the city. The Common Room aims to use the unique heritage of the Mining Institute to inspire the next generation of innovators and engineers, but to do that, we need to create not only a sustainable business model, but an environment which retains its sense of history, whilst being able to provide the kind of learning facilities and technology expected today. The project received initial support from HLF when it was awarded £600,000 of development funding to progress the plans and we were invited to apply for a full grant at a later date. To that end, we have recently submitted our bid for £4.1m to the HLF and aim to raise a further £3m match funding. “We are delighted to have been appointed to handle this wonderful conservation and redevelopment project. The greatest challenge has been to create inclusive access to the building. We have achieved this by using a circulation tower which provides a new lift and stair arrangement and gives access to all the principal spaces within the building while providing opportunities for the installation of mechanical and electrical plant. It culminates in additional office space contained within the existing roof level. The lecture theatre is to remain as one of the key spaces and the Wood Memorial Hall is to be retained with minimal intervention to the impressive fabric while the existing bridge link to the east elevation, which connects the building with the Literary and Philosophical Society is to be opened up and a new first floor link will connect to the new core to allow inclusive access into the space. The planning application was submitted March 2018 and determination is expected in May 2018. HLF, Liz Mayes, planning permission, Redevelopment. Bookmark.